BLUEPRINT AMERICA: Is New York a green town? 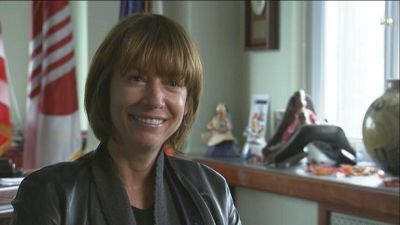 JANETTE SADIK-KHAN: I think New York is a green town and I think New York is becoming even more green. I think that the Mayor’s PlaNYC agenda, which is a sustainability agenda taking a look at 35 years from now, what is the city going to look like, what do we need to plan for. And basically designing strategies to help this be the biggest, greenest city on the planet. And what that means is really taking a look at our streets very, very differently. New York City DOT, we’ve actually translated PlaNYC – the Mayor’s sustainability agenda – into a program of projects and a vision for where we need to go in order to make this be the greenest, most sound, sustainable transportation system on the planet. And that means looking at our streets differently. BA: I know it’s a thick plan, but what is the overall philosophy, what are some of the things that are proposed here? JSK: Well, I think 21st century cities understand that sustainability and mobility are twin sides, of the same coin. If we are going to be a green city, we have to do everything we can to make it easier for people to get around by public transit. To make it easier for people to get around by walking. To make it easier for people to get around by bike and to really look at our streets as the valuable public spaces that they really are. I really think that New York City DOT is actually the largest real estate developer in the city. And New Yorkers take their streets very, very personally. They’re our living rooms, they’re our back yards. It’s where we do business. And they’re really more than just about utilitarian corridors getting people from point A to point B. They’re really places of social and economic exchange and we’re doing everything we can to improve the attractiveness and the quality of life in the City of New York through our transportation system. BA: You’re a cyclist and you ride to and fro work a lot and, I assume, elsewhere around New York City. Has it changed dramatically? JSK: It has changed dramatically. I think that there’s a sense of safety on the streets right now, that we’re rebalancing the streets a little bit, so making it easier for cyclists to be on the road and feel like they’re part of the system. Cycling in the last year alone has increased 35 percent in one year. BA: Is cycling for commuters or just in general? BA: What do you think triggered that? 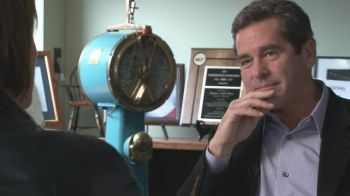 JSK: Well, I think we’re building out this extensive bike network and we’re really connecting places and I think people feel safer on the streets. And so, we’re striping them. You may have seen the green bike lanes that we’ve got there. We’ve got the protective bike lane on Ninth Avenue and we’re going to have a parallel corridor on Eighth Avenue. The goal is that cyclists wouldn’t have to get off the network at all. They could just get from point A to point B all along a bike path. So, that’s what we’re really striving to do and it makes sense because New York is essentially flat. And most of the trips are under two miles, and so it’s ideal for biking. And it’s good for your health, it’s good for your pocketbook, it’s good for the planet – it’s good all around. JSK: I think that there has been a sea change of understanding in terms of what we need to do going forward. The crisis of climate change has really woken everybody up. I think understanding that we’re in a global race in terms of being a world class city that attracts world class talent and continues to grow there’s an understanding that we need to do things a little bit differently if we’re going to continue to be the place that people want to live, work and play each and every day. Last summer we created a whole new pedestrian space at Madison Square Park. And even before we opened it up, we put these orange cones out there to wall off the roadway and people were just clustering in the orange coned area – sitting down, sketching the Flatiron Building. People are hungry for public space in New York City and the Mayor has made it a big priority. His PlaNYC sustainability agenda says that all New Yorkers should be within a 10 minute walk of greenspace. And so, we’re well on our way to getting that done. BA: It sounds suspiciously like central planning and we don’t do that in this country, do we? JSK: Well, I don’t think we do enough forward-looking planning. I think that’s why the Mayor’s PlaNYC agenda is so revolutionary. Because it basically said, we can’t just sit here and hope things are going to get better each and every day. We can’t wish congestion away. We have to plan our city. We have to plan for where we need to go. And that’s what we need to do for a city – as a city. That’s what we need to do as a state. And that’s what we need to do as a country.